Dinosaur Comics - March 3rd, 2010 - awesome fun times! March 3rd, 2010: I thought I'd made up "head-explosion disease" in yesterday's comic, but Paul wrote in to let me know that not only does it exist (what?? ), it's curable! PHEW. All words in the solution are dictionary words. What's more, all words in the solution are in the Jadrian's awesome Qwantz Corpus! The solution is natural-sounding, reasonably-grammatical dialogue that T-Rex would say, using phrasing that T-Rex would use. The punctuation :,!! is in the solution, in that order! The longest word in the solution is 11 characters long. The solution does not refer to anagrams or puzzles or winning t-shirts. 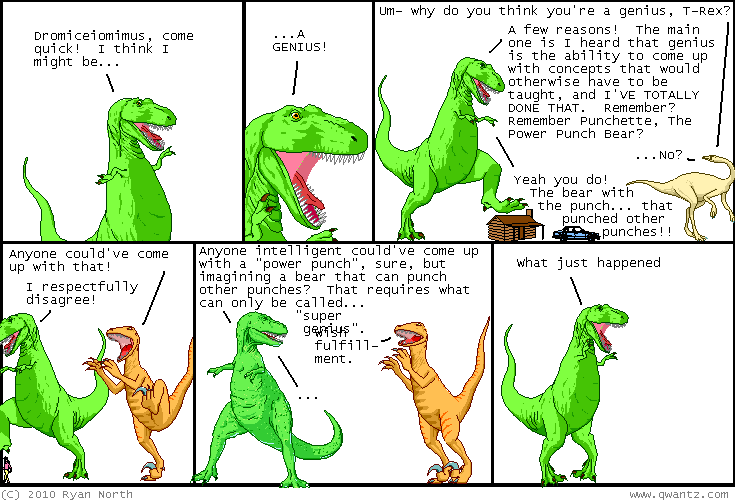 However, what T-Rex is saying is directly related to the content of the comic the puzzle appears in. The letters given are case-sensitive! The first word of the solution is "I". I tested out Joel's puzzle-solving tool and it does let you know that the correct answer works! Also linked on Joel's page are some brute-force scripts and even a branch-and-bound solver (awesome! ), but the solution is long enough to make pure brute force not really feasable. You'll have to use your head. I think that's pretty much it! Some of these clues I'd posted on Twitter or hinted at, but now they are explicit! And there's a few new pieces of information there too. Since this puzzle has gone unsolved for three days, the prize is now two t-shirts AND an adorable T-Rex Squishable! One year ago today: in undergrad i was batman against parking tickets. i can't tell you how; you'll all just have to accept it as the truth, okay?